Ettela'at Newspaper titling Tomorrow Morning at 9, Meeting with the Imam (Khomeini) in Tehran. Sayyid Ruhollah Mūsavi Khomeini (24 September 1902 – 3 June 1989), known in the Western world as Ayatollah Khomeini, was an Iranian Shia Muslim religious leader, philosopher, revolutionary and politician. He was the founder of the Islamic Republic of Iran and the leader of the 1979 Iranian Revolution that saw the overthrow of the Pahlavi monarchy and Mohammad Reza Pahlavi, the Shah of Iran. Following the revolution, Khomeini became the country's Supreme Leader, a position created in the constitution of the Islamic Republic as the highest-ranking political and religious authority of the nation, which he held until his death. 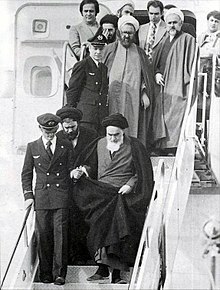 On 1 February 1979 Ayatollah Ruhollah Khomeini, returned to Iran after 14 years in political exile. Khomeini had been a prominent opponent of Mohammad Reza Shah Pahlavi, who had fled the country during the events of the Iranian Revolution. Upon his return, he was greeted by crowds of millions, and within 10 days the revolution would be successful. Khomeini's return and the 10 days following are now celebrated in Iran as the Fajr decade. At the age of 61, Khomeini found the arena of leadership open following the deaths of Ayatollah Sayyed Husayn Borujerdi (1961), the leading, although quiescent, Shi'ah religious leader; and Ayatollah Abol-Ghasem Kashani (1962), an activist cleric. The clerical class had been on the defensive ever since the 1920s when the secular, anti-clerical modernizer Reza Shah Pahlavi rose to power. Reza's son Mohammad Reza Shah, instituted a "White Revolution", which was a further challenge to the Ulama. Khomeini was arrested and was exiled from Iran for opposing the Shah's actions (Iran's ruling system). Khomeini was a marja ("source of emulation") in Twelver Shia Islam, a Mujtahid or faqih but he is primarily known for his political activities. He spent more than 15 years in exile for his opposition to the last Shah. Mostly in the holy Shia city of Najaf, Iraq. At first he was sent to Bursa, Turkey on 4 November 1964 where he stayed in this city hosted by a colonel in the Turkish Military Intelligence named Ali Cetiner in his own residence. In October 1965, after almost eleven months, he was going to move to Najaf, Iraq, where he stayed until 1978, when he was encouraged to leave by then-Vice President Saddam Hussein. By this time discontent with the Shah was becoming intense and Khomeini went to Neauphle-le-Château, suburb of Paris, France. Khomeini decided to return to Iran after Mohammad Reza Pahlavi, the Shah of Iran, fled on 16 January 1979. A welcoming committee was formed on 21 January 1979, to organise and ensure Khomeini's return. Kayhan and Ettela'at papers announced that Khomeini would return from Paris the other day. The news led to the flow of millions of people from different cities to Tehran. It was originally planned that Ayatollah Khomeini would enter Iran on January 26, but Prime Minister Shapour Bakhtiar announced that the airports would be closed. From Paris Khomeini declared that he would return as soon as the airports were reopened. The closure of the airports led to widespread protests and strikes. In Tehran alone 28 people were killed. On January 29, the airport was reopened on the orders of Bakhtiar and Khomeini stated a new return date of 1 February. On 1 February Khomeini flew to Iran in a chartered Air France plane as flight 4721. He was accompanied by supporters as well as 120 international journalists. The presence of journalists was in part to ensure the safety of the plane from being attacked. Journalist Peter Jennings asked Ayatollah Khomeini how he felt about returning to Iran after fifteen years. Khomeini famously answered: "Hichi" (Nothing). Khomeini's statement attracted much attention, and its meaning has been heavily disputed. Some amongst Khomeini's critics have claimed his response demonstrated apathy towards Iran and its people. Others have interpreted his response as inspired by Ibn Arabi's philosophy of the Perfect Man, and Shia mysticism, arguing that Khomeini was attempting to reach a perfect emotionless state, like that of the Mahdi..
On February 5th, Ayatollah Khomeini chose Mehdi Bazargan as Prime Minister of the interim government. On February 8th, Iranian air force officers went to Khomeini's home and promised their loyalty to the revolution. Two days later, people[who?] were armed by the revolutionary personnel of the air force. Bakhtiar's government announced a curfew that Ruhollah Khomeini urged people to disregard. Revolutionaries subjugated police stations, prisons and governmental centers. On February 11th, senior military commanders announced that they were neutral in conflict between Bakhtiar's government and revolutionaries. Because of this, they pulled their troops from the streets. Bakhtiar resigned and went to Paris. Revolutionaries gained a victory on this day. The ten days between Khomeini's arrival and revolutionary victory are celebrated in Iran as the Fajr decade. ^ Sciolino, Elaine (27 August 2000). "nyt.com The People's Shah". New York Times. Retrieved 19 March 2010. ^ "Oral History of the welcoming committee of Imam Khomeini". Retrieved 14 May 2015. ^ "11 Bahman 1357, tomorrow morning at 9, visiting Imam in Tehran". ^ Abrahamian, Ervand (1982). Iran between two revolutions. Princeton, N.J.: Princeton University Press. ISBN 069100790X. ^ Jerome, Carole (1 September 1980). "Back to the Veil". New Internationalist (091). Retrieved 3 August 2013. ^ "12 Bahman: Khomeini Returns". PBS. 1 February 2009. Retrieved 4 August 2013. ^ Axworthy, Michael (2007). Iran : empire of the mind : a history from Zoroaster to the present day. London: Penguin. pp. 265–6. ISBN 014103629X. ^ "On This Day: Ayatollah Khomeini Returns From Exile". 2011. Retrieved 14 May 2015. ^ a b Iran Country Study Guide Volume 1 Strategic Information and Developments. Lulu.com. 2012. p. 65. ISBN 9781438774626. ^ Gölz, "Khomeini's Face is in the Moon: Limitations of Sacredness and the Origins of Sovereignty. ", In Sakralität und Heldentum. Edited by Felix Heinzer, Jörn Leonhard and von den Hoff, Ralf, 229–44. Helden - Heroisierungen - Heroismen 6. Würzburg: Ergon, 2017, p. 243. This page is based on the Wikipedia article Ruhollah Khomeini's return to Iran; it is used under the Creative Commons Attribution-ShareAlike 3.0 Unported License (CC-BY-SA). You may redistribute it, verbatim or modified, providing that you comply with the terms of the CC-BY-SA.